Edwards has a strong polling lead, but will it hold up? Based purely on poll numbers, the Louisiana gubernatorial race should be easy to call. State Rep. John Bel Edwards (D) leads Sen. David Vitter (R) by 11 percentage points in the current HuffPost Pollster average, a seemingly insurmountable lead with the runoff contest taking place just two days from now on Saturday. But these days there are serious questions about the credibility of polls. Earlier this month we saw just how wrong surveys can be. In Kentucky, state Attorney General Jack Conway (D) held a narrow but consistent lead over Matt Bevin (R), only to have Bevin win in a rout. The polls were actually pretty close on Conway’s final percentage (43.8% actual versus 43.0% to 44.3% in the averages); they just happened to vastly underestimate Bevin’s support and exaggerated the independent candidate’s position (a common problem seen in contests with relevant third-party candidates). In the Kentucky race, seemingly all the undecideds broke for Bevin (though we are not really convinced of this — it’s a cop-out for pollsters). We had witnessed similar occurrences in previous races in the 2013 and 2014 cycles in states such as Kansas and Virginia, but the Bluegrass State contest cemented our skepticism about Democrats running ahead in very red states. Thus, we have scrutinized Edwards’ lead in the Pelican State by delving into the polling averages of U.S. Senate and gubernatorial races from past cycles. Should Edwards lose while his polling average remains very slightly above 50%, he would have the highest polling average of any candidate who lost, dating back to 2004 from available polling averages tabulated by RealClearPolitics and HuffPost Pollster. In fact, the highest average percentage any losing candidate has had was Paul Davis (D) in Kansas’ 2014 gubernatorial contest. He led Gov. Sam Brownback (R) 50.0 to 48.1 in the final Pollster average, only to lose 49.8% to 46.1% on Election Day. (Davis also led in RealClearPolitics’ average, but only 44.6% to 42.6%.) 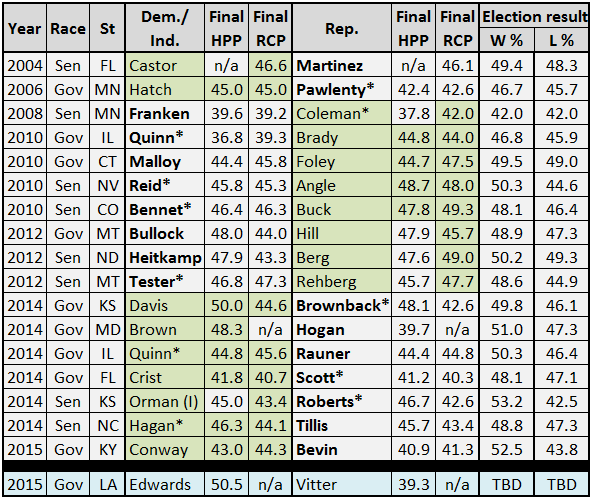 Davis is the only losing candidate to end an election at 50.0% in either polling average in the timeframe we examined. Table 1 shows the losing candidates who led in at least one final polling average dating back to 2004 (RealClearPolitics goes back to 2004, Pollster to 2006). Notes: Candidates shaded in green lost despite leading in at least one average, and averages that are shaded green indicate ones where the losing candidate led. The bolded candidate won the race. *Indicates an incumbent. Note that the two polling averages use different methodologies. Currently, RealClearPolitics does not have an average for the 2015 Louisiana gubernatorial contest. HuffPost Pollster average as of Wednesday afternoon. Given this history, the fact that Edwards is above 50% (very narrowly) in the polls suggests that he may just be strong enough to actually win. Reports about early voting also sound slightly favorable for Edwards — black and urban turnout is up narrowly, as is the participation of registered Democrats, though many of them are really Republican-leaning voters who first registered as Democrats when it was a more conservative party. Despite our misgivings because of the Kentucky result, we are moving the Louisiana gubernatorial contest to Leans Democratic. For all the comparisons to Kentucky, the Louisiana race is different, as Kyle Kondik noted last week. Louisiana has a larger African-American voter base that raises Edwards’ support floor. While many Republicans in Kentucky expressed dissatisfaction with Bevin, no major Republican endorsed the Democrat in the race, which has happened in Louisiana (GOP Lt. Gov. Jay Dardenne, who finished behind Vitter in the jungle primary). There may be sufficient division within the GOP over Vitter’s standing that enough white voters will back Edwards to put him over the top. Looking every bit the underdog, Vitter is throwing the kitchen sink at Edwards, tying him to President Obama’s decision to accept Syrian refugees in the United States as well as criticizing the Democrat for “skipping a family issues debate to bus voters from a New Orleans night club.” We suspect that the more potent attack for Vitter (and Republicans in general) will be those involving the Paris terrorists and Syrian refugees. President Obama’s strategy against ISIS is drawing heavy scrutiny, and Republicans are on the offensive. If the horse race polls are right — definitely an uncertain assumption in the current era — they show that Edwards has managed to avoid being tied to the president in deeply conservative Louisiana. But that could change in the last days if Vitter can make his attacks on refugee and national security policy more firmly connect Edwards to Obama. More than ever, a Democratic loss in Louisiana would be laid at Obama’s feet. Considering these developments in the race, we can’t say we’re supremely confident in leaning the contest toward Edwards. Still, Vitter remains a damaged candidate, dragged down by his personal baggage and the unpopularity of Gov. Bobby Jindal (R-LA), and Edwards is still a touch above 50% in the polling averages. Therefore, he has to be viewed as at least a slight favorite for the Nov. 21 runoff.